Regular readers know one of my favorite things to do is explore a new beach and Second Beach on the Washington coast has moved to the top of my list. I’ve posted a few photos from this visit and there will be more to come but today I have this black and white view for Lens and Pen by Sally’s Phoneography and Non-SLR Digital Photo Challenge: Black and White. This is an amazing shot and I want to go walk barefoot there. The textures of the sand really lend themselves to the black and white editing. So beautiful. I’m glad you like it, Princess. The color version is special to me because it’s like standing there but I really like how the textural details become clear in black and white. Wonderful in black and white! A fun interpretation, M-R. 🙂 The sea stacks (rocks) along this stretch of coast are so interesting! Marvelous sweeping scene of the Northwest coastline. Your perspective and the black and white give the image a bold patina that also is made inviting by the contrasts and textures. I want to go walk there right now. Happy Photo Challenge. I love the iphone camera, can’t wait to get the 6, wondering though about the Samsung Galaxy also, heard the photo’s are good. 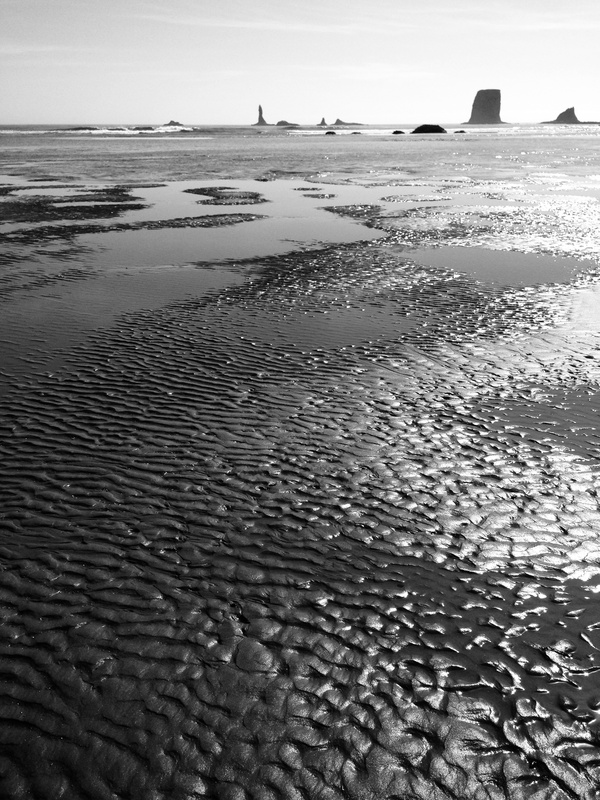 I think the photo of the beach is amazing, such beautiful detail and I always love a B&W photo. This picture is frame-worthy, Lisa. Amazing shot, Lisa! You have raised the bar for the iPhone photography! Gorgeous light and texture in these shots! Lovely. What time of day did you take them? It’s great to hear you like this post, Patti! We were at the beach during late afternoon and I think this shot was taken about 4:30. Great perspective and shots, Lisa! Love the texture you got. Thanks, Janet it’s so nice to know you like it! I love the texture and perspective — great shot! Wow, serious low tide. It must be interesting to see what lays lurking under the rocks or even under the mud. Your composition is great and the lighting and textures are wonderful. Congratulations on this image. Thanks so much for your nice comments, Allan they mean a lot to me coming from such a talented photographer. Thanks, we were there at the perfect time of day just after low tide and right as the sun started to head toward sunset. I can’t wait to go back for a return trip. A sci-fi landscape, Lisa! The way you captured the textures and different forms is masterful. I also love it in black and white. Thanks, Paula! I agree this does have a little bit of a sci-fi feeling to it. 🙂 I like the color version because it reminds me of standing there but the contrasts are more striking in black and white. I’m glad you think it works!